Dietary fiber is known for its ability to support and maintain intestinal regularity. It is classified as being either soluble, meaning it dissolves in water to form an almost gel-like substance, or insoluble, meaning it resists digestion, moves through your body faster than soluble fiber, and adds bulk to your stools. Many Americans do not get enough fiber from their diets. 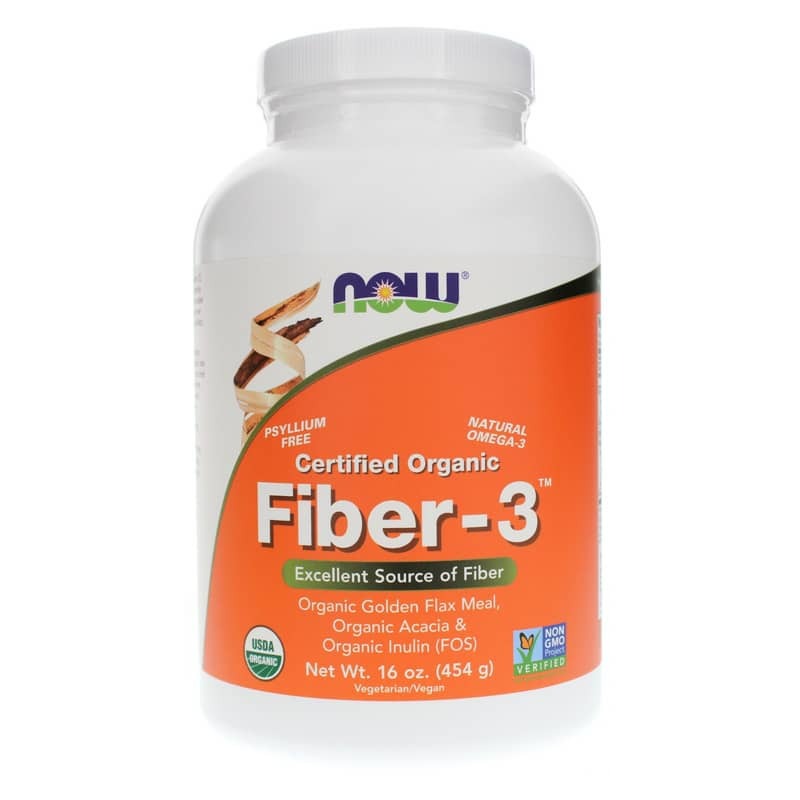 Now Fiber-3 may help with its blend of fibers from certified organic golden flax seed meal; acacia, a shrub native to the US; and inulin, a water-soluble dietary fiber found naturally in many foods. Golden Flax Seed contains both soluble and insoluble fibers as well as lignans that can act as antioxidants. Golden flax seed also contains omega-3 fatty acids that may support heart health by supporting healthy blood pressure, as well as cholesterol and triglyceride levels. Acacia is rich in soluble fiber that can help to control gas and bloating associated with high fiber intake in some individuals and inulin acts as a prebiotic, providing food for friendly intestinal bacteria. 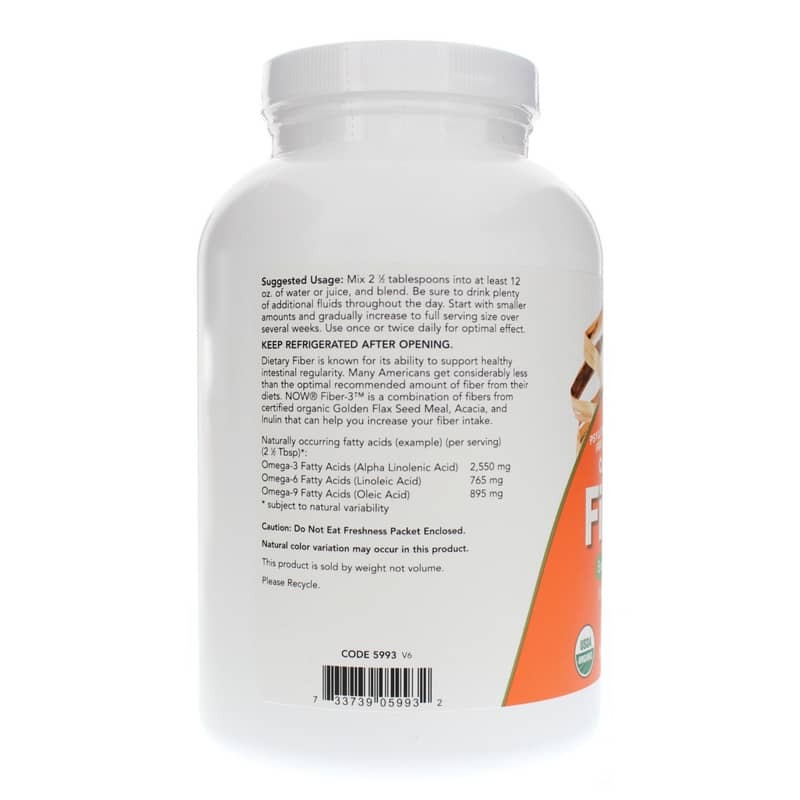 The inulin in this formula is in the form of a fructo-oligosaccharides (FOS), a prebiotic that serves as a source of food for the good bacteria in your digestive system. 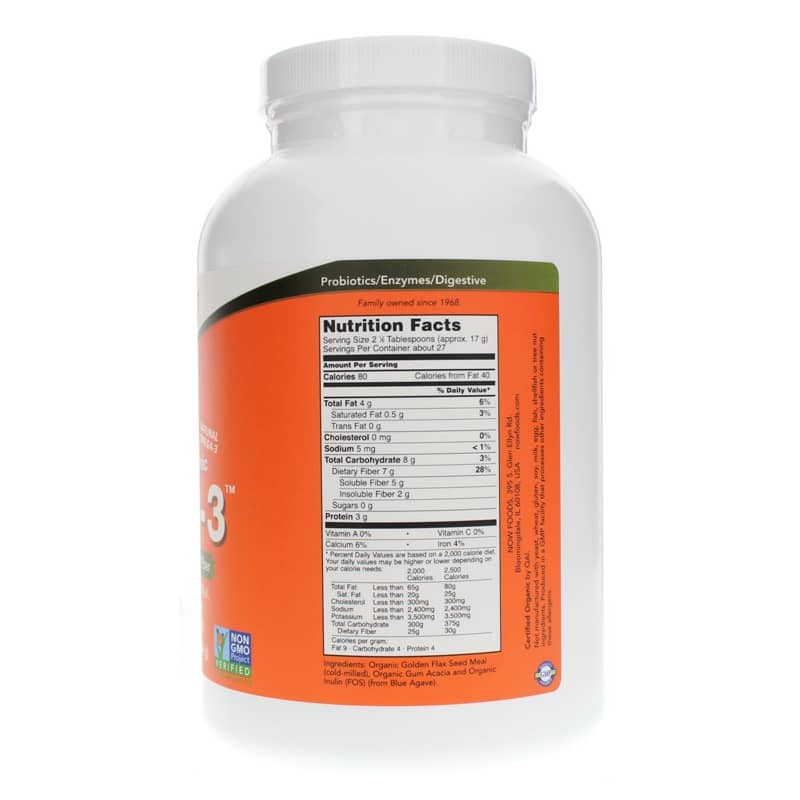 The properties of the three fiber sources combined in Now Fiber-3 combine to support and maintain healthy intestinal flora and regularity. To use as a dietary supplement, you can mix 2 1/2 tablespoons, or 17 g, into at least 12 oz. of water or juice, and blend. Be sure to drink plenty of additional fluids throughout the day. You should begin with smaller amounts and gradually increase to a full serving size over several weeks. And you should use this formula once or twice daily for optimal effect. Not manufactured with: yeast, wheat, gluten, soy, milk, egg, fish, shellfish or tree nut ingredients. Produced in a GMP facility that processes other ingredients containing these allergens. Vegetarian/Vegan. Adults: Mix 2 1/2 tablespoons into at least 12 oz. of water or juice, and blend. Be sure to drink plenty of additional fluids throughout the day. Start with smaller amounts and gradually increase to full serving size over several weeks. Use once or twice daily for optimal effect. Keep Refrigerated after opening.